What better way to get into the mood of St Patrick’s Day than to head up to the northern reaches of Scotland, eh? The ever inimitable Una and I, following a gush of post-Edinburgh enthusiasm on her part, booked a trip up to Aberdeen – ostensibly to go & see Aberdeen Gang Show – and following a fairly event-free Heathrow experience, so too there we were (try to get any value out of THAT sentence!). During transit to our hotel it occurred to me that once again I’d gone off to an exotic location without knowing the first thing about it (other than of course it being the birthplace of the iron lung, water polo, and the self-sealing envelope), and so I set to mining the most knowledgable source available to me – our cab driver. 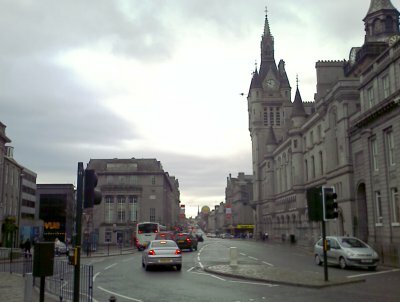 Apparently Aberdeen is known as “The Oil Capital of Britain”, and as such is filled during the week with itinerant workers in the oil biz who then shoot through on weekends. In the past Aberdeen has been famous for its granite (pretty much the entire city seems to be built of the stuff, as well as Waterloo Bridge and the terraces of the Houses of Parliament being Aberdonian Granite also), and it also had a formidable fishing industry. The fishing seems to have all but dried up to neighbouring Peterhead – the reason being that Aberdeen increased its mooring fees, and the legendarily “thrifty” Scots deemed it more economical to go moor up the coast. Nice one Aberdeen. 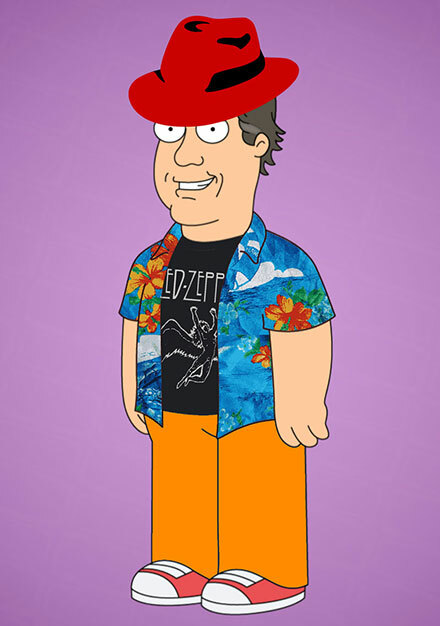 I established that the local beers were Tennants and McEwans. This suggested that whisky would have to do for the weekend. Upon arriving at the hotel, Una confessed that she hadn’t understood a word of what the cab driver had said. A brief survey of our local bars revealed that the hotel bar was possibly the best option, and we were attended to by a Captain Combover night porter who was helpful enough, but when I sought to engage him on whisky he asserted that the bar we were in had a pretty good range (6 or 7 malts), and that the best one to buy was Dalwhinnie – you’ll not often find a whisky as well-made as that. This worried me somewhat, as I was counting on the fact that I was in Scotland to implicitly provide me with a cornucopia of whisky everywhere I went – especially to make up for the fact that the only beer options seemd to be a vile lager, and another slightly less vile lager. The nail in the coffin seemed to arrive when we dropped into Burger King for a post-flight late night desperation snack, and leaning up against the counter devouring a Bacon Double Grease McChuckburger was a youth of about 16, dangling the handle of a blue carrier bag in the crook of him arm, from which was dripping the contents of his now broken bottle of sherry. Sherry’s the underage drink of choice eh? I think I want out of this weekend. On Saturday morning we commenced a wander around and I concede that my first opinion was “grim”. I think it was the endless plains of granite that stratched out before me that did it, which seemed to stretch upwards to meet the gloomy overcast sky. Apparently the locals call it “the silver city”, which makes sense given current geriatric descriptive phrases. 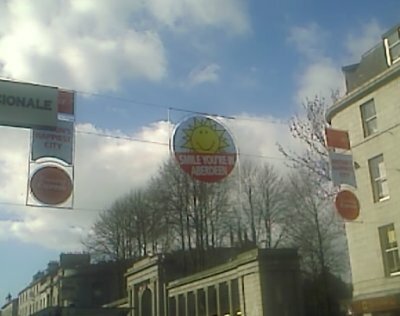 What amused me the most I think was that strung out across Union Street were banners proudly championing the fact that Aberdeen was “Britain’s Happiest City”… “SMILE! YOU’RE IN ABERDEEN!”. Oh yes, happiness, thy name is granite. Following a wander about the shopping districts of Union Street (and a covert pub recce by me) we headed to the Aberdeen Arts Centre to make our initial contact with the Gang Show crew, and in little to no time we were being given a tour & introduction to everyone by Ian Dow, their convenor/producer. The Gang all seemed really friendly, and quite stoked that people would come visiting from an Australian Gang Show. We volunteered to help out if we could, and were tasked with helping set up & run the between-show meal. During this we got to meet everyone a bit more, and sit & have a chat with some of the kids. It was amazing how welcoming they were, and how familiar it all was – that’s an aspect of Gang Show which I think I’d forgotten in the last couple of years. They also invited us to stay for their crew show (like AGS’s Compact Show – a chance for the backstage and other areas of the show to take off the numbers in the show), and they presented us with Aberdeen Gang woggles in front of the assembled Gang! Finally we got to see all these people doing their thing on stage, and it was great fun. It was a really fun, entertaining show, which didn’t pretend to be “legitimate theatre”, but rather a bunch of young amateurs having an honest go at being entertaining. Loads of smiles, loads of people enjoying putting on a performance, some appalling groaner jokes (e.g., a kid who goes in to hospital saying that he feels fine, but any part of his body he touches makes him shriek with pain – turns out he’s got a broken finger), and some really good singing. They asked us back on stage after to speak to them, and I got a huge buzz from the whole thing really – very unusual to get a mass wave of “welcome!” from a group that size outside of somewhere I’m from! We stuck around & helped them bump out, then went to the after party, and that was that. After a bloody spectacular lunch on Sunday, I decided my mission was to find somewhere to score a decent whisky – I wasn’t going to resign to the fact that Aberdeen didn’t have any. Heading in to Oddbins, I got chatting with this really cool sales assistant (whose phone number I should have tried much, MUCH harder to get), and she gave me a few decent tipoffs. We went to the first one (The Howff), which was areally cool little basement pub. The next one (Prince of Wales Alehouse) was a genuine A-class tip (“tip” as in “suggestion”, not “place you leave refuse”). 6 or 7 beers on, and a chilled, easy atmosphere. Could’ve spent a few hours in there (their Orkney ales were in fine form, and I had a Red Ale whose name escapes me, but WALLOP! Flavour ahoy! ), but we had to press on and find the third tipoff the nice lady had given us. Finally, after much confusion and head scratching, we found The Grill – upon finding it I suddenly realised why it’d taken us so damn long to find. From the outside it resembles an extremely dodgy barbershop: opaque metallic panes and a red & white letraset-style sign. The nice lady had stressed that it was worth it despite outside appearances, so steeling myself for something unexpected I walked in… to an Aladdin’s Cave of whisky! What an amazing place. 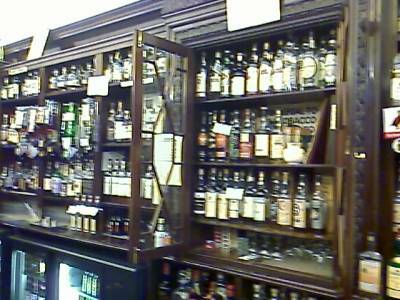 My palms went sweaty and my knees went weak as I approached the solid wooden bar to peruse the options. Luckily, the extraordinarily helpful manager Murray was there to offer suggestion, or I could have been perusing for quite some time (and we only had 2 hours to spend there). They’ve got about 400 whiskies to choose from – in hindsight it’s a good job I only had 2 hours, or I may not have made that plane. I started off with an Ardbeg Serendipity – something I’d recently read about and had almost given up on trying to acquire a bottle of. It turned out to be utterly worth the effort, too! Quite robust and definitely with Ardbeg pedigree, but mellowed by the mixture of Glen Moray. I don’t usually go for vatted malts, but this was exceptional. Following up I went for a Glen Garioch 15 – I remember it being very pleasant, but now further detail escapes me. I’ll be following this one up further on our trip in May, however. To round out the afternoon I settled on a Balvenie 21 Portwood finish. Murray had departed by this point, so I was served by a girl, who warned me “Are you sure, that’s quite expensive…”. Double-checking, it was indeed about £6 a dram – not cheap, but when you consider that in London you can find places that’ll charge you £7 for a dram of Glenfiddich it hovers back into perspective. It might have cost 6 quid, but it was worth 20 – it was like a liquid version of a Baz Luhrmann film. Rich, deep, velvety, raunchy, and plenty of action. I reckon that’s what pirates would drink (assuming they were well-paid and had any damn sense about them). So anyway, that was Aberdeen. Amazing how a place can open up so much once you talk to the right people. Previous Post2007-03-12 : Heeeeeeeeeere we are in New South Wales, sheeeeeeearring sheep as big as whales (or Wales – hard to tell). Next Post2007-04-03 : THIS IS SPARTA!